The Never Knowingly Undersold price guarantee has labelled a ‘straitjacket’ that has wiped out profits at John Lewis, experts said last night. The department store revealed that half-year profits were likely to plunge to close to zero, while full-year earnings are expected to be ‘substantially lower’ than last year. But yesterday experts warned the firm’s lauded price promise was at the root of the problem as the chain had been forced to slash prices to keep up with budget rivals. In response to the profits crisis the partnership announced a major overhaul, changing its branding, revealing a multi-million pound IT investment and vowing to sell more own-brand items. 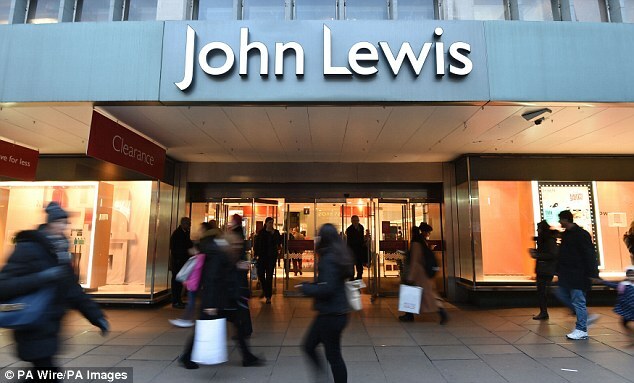 John Lewis is now planning to make half the products it sells either own-brand or exclusive. Currently, 30 per cent of its sales come from these products. Analysts said this would reduce the impact of the price pledge – as own-brand and exclusive deals cannot be compared to rivals. Patrick O’Brien, UK retail research director at GlobalData, added: ‘John Lewis has been hamstrung to by its price guarantee because they’re offering a much better shopping environment but then having to price match promotions on branded products. The latest profits crisis at John Lewis comes after they plummeted 77 per cent to £103.9m last year at the John Lewis Partnership and follows it shelling out tens of millions on restructuring. John Lewis’s Never Knowingly Undersold price pledge was launched in 1925 and promises that if a customer finds a product cheaper elsewhere, it will reduce its price to match. This includes for online deals. The policy has become tested as struggling rival department stores have been running major promotional events in a bid to lure in shoppers. ARE GIMMICKS TO BLAME FOR SALES FLOPS? Both John Lewis and Waitrose have come up with a series of marketing gimmicks to woo more shoppers into stores. But some have been ridiculed – while others have been scrapped completely. John Lewis and Waitrose are ditching their famous green logos in favour of plain black and white variants. The diagonal green stripes on its plastic bags – which are lighter for Waitrose and darker at John Lewis – were created in 1990 and are supposed to reflect the facade of its Leeds department store. The group is also rebranding store names to John Lewis & Partners and Waitrose & Partners to reflect the fact the firm is run as a partnership, so staff share in profits.